TRIVIA of Noh : Q153 : Are there any everyday terms that originate in Noh? | Home | Trivia | Q153 : Are there any everyday terms that originate in Noh? Are there any everyday terms that originate in Noh? Many familiar Japanese words were born from Noh. 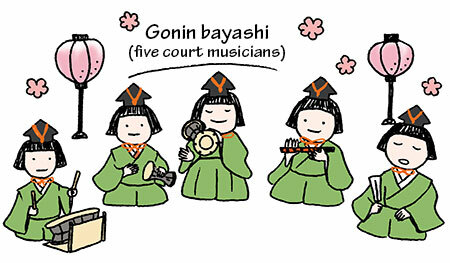 The term for the Doll Festival on March 3, “gonin bayashi” (five court musicians), comes from hayashi, the music that accompanies Noh plays. In Noh performances, several singers chant together, but the band of hina dolls comprises only one singer and four players, making a group of five musicians. Hayashi comprises five parts: four by musical instruments (called odōgu) and one by reciters (jiuta). The four instruments are the kotsuzumi (small hand drum), ōtsuzumi (large hand drum), taiko (drum), and fue (or nōkan; Japanese flute). Usually, hayashi-kata play the instruments and actors perform jiuta. Because the musicians in hayashi-kata are professionals, they never switch to other instruments. Jiuta relays the descriptive part of stories by voice. Other terms were also born from hayashi. For example, the original meaning of an expression for a triple threat, “sanbyōshi-sorou” (literally, three beats are together), is that the beats from the kotsuzumi, ōtsuzumi and taiko (or fue) are in harmony. Meanwhile, an expression for getting quickly into rhythm is “nori-ga-yoi” (literally, nori is good). Here, “nori” refers to the rhythm of hayashi in Noh performances. Away from hayashi, the term “hinoki-butai” (literally, Japanese cypress stage) suggests a ceremonial occasion to show one's skill. This is because Noh stages are made of cypress wood and the art has its own established formalities. We call a person who plays a secondary role “wakiyaku” because waki refers to a supporting actor of Noh plays. The terms “shibai” and “bangumi” (see Trivia Q106) are other examples that originate from the world of Noh.